This book has a clean hardback cover with minor shelf-wear on edges and corners. Binding is tight and square. Interior pages are clean and free from highlighting, pencil underlining, notes, or stains. The book is in stock and ready to ship same or next business day. Thank you for buying from Wado Books! 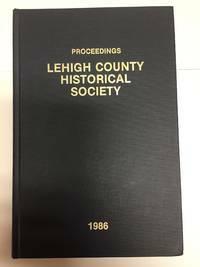 Essays include: "The Social and Architectural History of Old Allentown" by Karyl Lee Kibler Hall, "Building the A-B-E Airport: Reminiscences of John Henry Leh" by Frank H. Sherry and Mahlon H. Hellerich, "Chapters from the Lehigh River on David Thomas and David Saylor" by Amos Aschbach Ettinger. Other proceedings in the volume relate to history and contributions os the historical society. Please see the photos in this listing.